If you do not wish to vote at this time, click here to visit Torva Cattus [A Revolutionary Big Cat Simulation] stats. Come in and save hundreds of felines with your super kitty saving super power! Okay well maybe we’re exaggerating a bit. 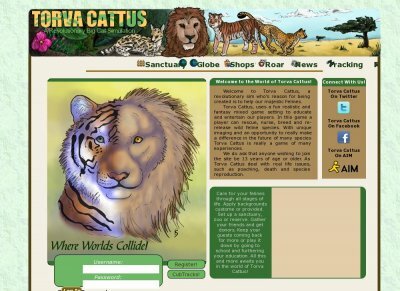 Torva Cattus is a big cat rescue simulation game. You gather all of the resources you need to gain donors and raise the prestige of your sanctuary. Stop poachers around the world with a single stare and repopulate diminishing feline populations. Become the beacon of Feline Champion work! Torva Cattus is a game of many experiences. You start with a sanctuary and venture into the business of owning a Zoo or Reserve each with their own set of goals. Players are able to reset and start over as often as they’d like. You are able to trap felines, go to university, have a job, run a business, breed new felines, and repopulate the game. Torva Cattus has many types of feline from those found in the world with varying degrees of conservation needs, extinct felines and a list of fantasy felines. The game allow choices to be made throughout the game, this makes your experience different from another player experience. Set up and play a while. Torva Cattus offer out of game playing around the site, gaming in the game center and role playing set up for your enjoyment. Torva Cattus, uses a fun realistic and fantasy mixed game setting to educate and entertain our players. In this game a player can rescue, nurse, breed and re-release wild feline species. Stop by the site, make new friends, explore the world and have fun making a difference.